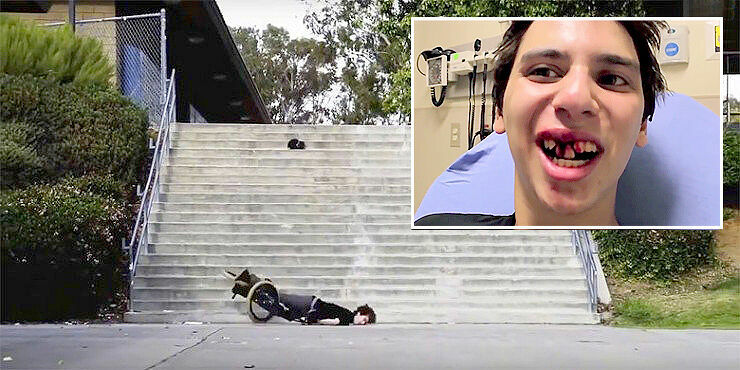 'The Most Painful Video On The Internet' Is A Wince-Inducing Compilation Of Pure Ouch! To paraphrase one of the commentators on a basketball game injury in this video—if you can bare to watch it take a look, but these are terrible-looking injuries. Basically you're going to start off watching it wincing and finish watching with a similar expression on your face. Which pretty much sums it up. In fact, your face will probably not even move from that starting wince, frozen throughout as you watch in horror and vicarious pain as people endure all types of 'ouch'. And it's not pretty, that's for sure. Some of it is self-inflicted, some of it is the result of being very, very stupid, other times the blame is more indirect–all of it is going to make you feel for these people. All of it is 100% pure pain. Teeth are smashed, backs are jet-sprayed, arms are snapped, faces are slammed into concrete, legs are gashed, hands are wilfully dumped into sodium acetate (or hot ice). At times it makes for grim viewing and it's not for the squeamish, as there's plenty of blood on show here, and broken bones. Forget those PG-rated Facebook videos, this is real old skool flesh-and-bones fails. But, if anything, maybe view it as a kind of health and safety video. Not for the workplace, but for life in general. Just stay safe and as pain-free as possible out there.